Welcome to Part II of The Cornell Study! As mentioned in my last post, I will be discussing the finds C.J. Greenwalt, R.A. Ledford, and K.H. Steinkraus made from performing their research in their study "Determination and characterization of the anti-microbial activity of the fermented tea Kombucha." 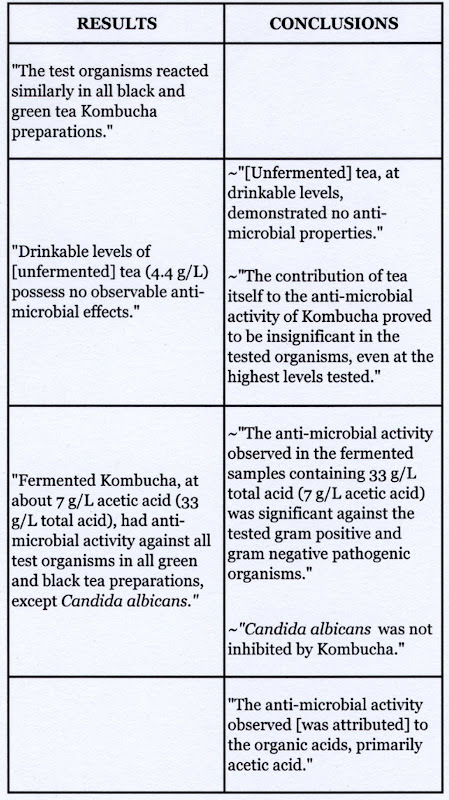 Again, their MISSION for the study was "to determine and characterize Kombucha's anti-microbial activity" and also to see if drinkable levels of unfermented tea carry anti-microbial properties. They tested both black tea leaves (Lovers Leap Orange Pekoe Tea and Pure Premium Ceylon Tea) and green tea leaves (Japanese Sencha Tea and Pure Premium Green Tea) from Metropolitan Tea Company Ltd. The tea leaves were steeped for 30 minutes and then removed. "The fermentation was terminated at the...pleasing [and desired taste and acidity] of about 33 g/L (3.3%)." "The fermentation time averaged nine days at 25°C [77°F]." "The bacterial species were chosen to represent the most common pathogenic and undesirable organisms associated with food." "The Kombucha colonies used in this investigation had a tendency to produce about:"
"Kombucha may be a healthful beverage in view of its anti-microbial activity against a range of pathogenic bacteria. This may promote immunity and general well being." I hope you found the Cornell Study as interesting as I did, and please ask me if you have any questions! -Greenwalt, C.J., R.A. Ledford, and K.H. 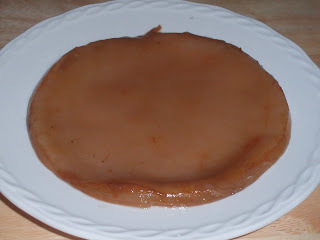 Steinkraus. "Determination and characterization of the anti-microbial activity of the fermented tea Kombucha." Lebensmittel-Wissenschaft und-Technologie 31 (3) (1998): 291-296.